While nearly all “orthodox” authorities of eminence concede that sheol and Hades [e.g. in Luke 16:19-31] do not denote a place of torment in the future world, most of those who accept the doctrine of endless torment claim that Gehenna does convey that meaning. This place is the last ditch of those who are struggling to establish the fact of the endless supremacy of sin and sorrow. It is the malakoff of orthodoxy. But no such force resides in this word, nor is there a scintilla of evidence that it ever was imagined to carry such an idea until many years after Christ. An examination of the Bible use of the term will show us that the popular view is obtained by injecting the word with current pagan superstition. Its origin and the first references to it in the Old Testament, are correctly stated by eminent critics and exegetes. As we trace the history of the locality as it occurs in the Old Testament, we learn that it should never have been translated by the word Hell. It is a proper name of a well-known locality, and ought to have stood Gehenna, as it does in the French Bible, in Newcome’s and Wakefield’s translation, in the Improved Version, Emphatic Diaglott, etc. Babylon might have been translated Hell with as much propriety as Gehenna. It is fully described in numerous passages in the Old Testament, and is exactly located on earth. 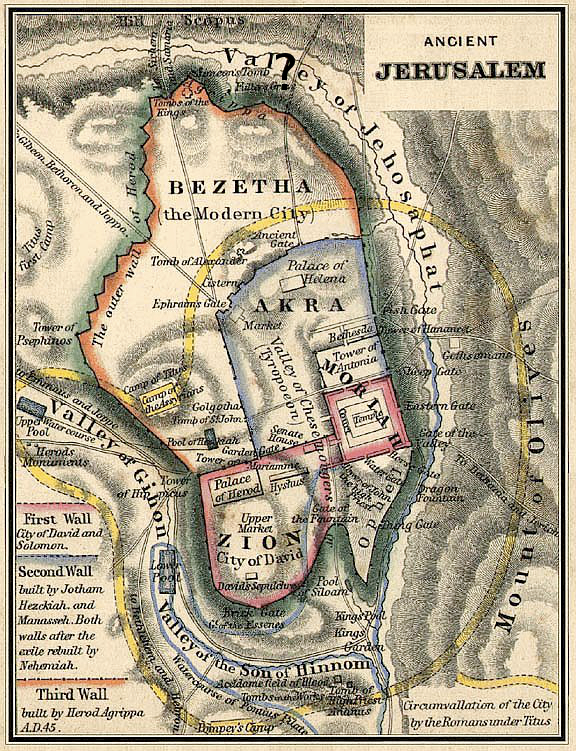 These and other passages show that Gehenna was a well-known valley, near Jerusalem, in which the Jews in their idolatrous days had sacrificed their children to the idol Moloch, in consequence of which it was condemned to receive the offal and refuse and sewage of the city, and into which the bodies of malefactors were cast, and where, to destroy the odor and pestilential influences, continual fires were kept burning. Here fire, smoke, worms bred by the corruption, and other repulsive features, rendered the place a horrible one, in the eyes of the Jews. It was a locality with which they were as well acquainted as they were with any place in or around the city. After these horrible practices, King Josiah polluted the place and rendered it repulsive. These passages show that Gehenna or Tophet was a locality near Jerusalem, and that to be cast there literally, was the doom threatened and executed. Every Bible reference is to this world. But in process of time Gehenna came to be an emblem of the consequences of sin, and to be employed figuratively by the Jews to denote those consequences. But always in this world. The Jews never used it to mean torment after death, until long after Christ. That the word had not the meaning of post-mortem torment when our Savior used it, is demonstrable: Josephus was a Pharisee, and wrote at about the time of Christ, and expressly says that the Jews at that time (corrupted from the teachings of Moses) believed in endless punishment, but he never employs Gehenna to denote the place of punishment. He uses the word Hadees, which the Jews had then obtained from the heathen, but he never uses Gehenna, as he would have done, had it possessed that meaning then, This demonstrates that the word had no such meaning then. In addition to this neither the Apocrypha, which was written from 280 to 150 B.C., nor Philo, ever uses the word. It was first used in the modern sense of Hell by Justin Martyr, one hundred and fifty years after Christ. The Jewish talmud and targums use the word in the sense that the Christian Church has so long used it, though without attributing endlessness to it, but none of them are probably older than A.D. 200. The oldest is the targum (translation) of Johathan Ben Uzziel, which was written according to the best of authorities between A.D. 200 and A.D. 400. “Most of the eminent critics now agree, that it could not have been completed till some time between two and four hundred years after Christ.” Univ. Expos. Vol. 2, p. 368. The Apocrypha, B.C.150-500, Philo Judaeus A.D.40, and Josephus, A.D.70-100, all refer to future punishment, but none of them use Gehenna to describe it, which they would have done, being Jews, had the word been then in use with that meaning. Were it the name of a place of future torment then, can any one doubt that it would be found repeatedly in their writings? And does not the fact that it is never found in their writings demonstrate that it had no such use then, and if so, does it not follow that Christ used it in no such sense? Gehenna is the name given by Jews to Hell. Rev. H. N. Adler, a Jewish Rabbi, says: “They do not teach endless retributive suffering. They hold that is is not conceivable that a God of mercy and justice would ordain infinite punishment for finite wrong-doing.” Dr. Deutsch declares: “There is not a word in the Talmud that lends any support to that damnable dogma of endless torment.” Dr. Dewes in his “Plea for Rational Translation,” says that Gehenna is alluded to four or five times in the Mishna, thus: “The judgment of Gehenna is for twelve months;” “Gehenna is a day in which the impious shall be burnt.” Bartolloci declares that “the Jews did not believe in a material fire, and thought that such a fire as they did believe in would one day be put out.” Rabbi Akiba, “the second Moses,” said: “The duration of the punishment of the wicked in Gehenna is twelve months.” Adyoth iii:10. Some rabbis said Gehenna only lasted from Passover to Pentecost. This was the prevalent conception. (Abridged from Excursus v, in Canon Farrar’s “Eternal Hope,” He gives in a note these testimonies to prove that the Jews to whom Jesus spoke, did not regard Gehenna as of endless duration). Asarath Maamaroth, f. 85, I: “There will hereafter be no Gehenna.” Jalkuth Shimoni, f. 46, I: “Gabriel and Michael will open the eight thousand gates of Gehenna, and let out Israelites and righteous Gentiles.” A passage in Othoth, (attributed to R. Akiba) declares that Gabriel and Michael will open the forty thousand gates of Gehenna, and set free the damned, and in Emek Hammelech, f. 138, 4, we read: “The wicked stay in Gehenna till the resurrection, and then the Messiah passing through it redeems them.”: See Stephelius’ Rabbinical Literature. Before considering the passages of Scripture containing the word, the reader should carefully read and remember the following. Gehenna was a well-known locality near Jerusalem (see Josh. 15:8; 2 Kings 17:10; 2 Chron. 28:3; Jer. 7:31-32; Jer. 19:2). Gehenna is never employed in the Old Testament to mean anything else than the locality with which every Jew was familiar. The French Bible, the Emphatic Diaglott, Improved Version, Wakefield’s Translation, and Newcomb’s retain the proper noun, Gehenna, the name of the well-known place. Gehenna is never mentioned in the Apocrypha as a place of future punishment, as it would have been, had such been its meaning before and at the time of Christ. No Jewish writer contemporary with Christ, such as Josephus, or Philo, ever uses it as the name of a place of future punishment, as would have been done had such then been its meaning. No classic Greek author ever alludes to it, and therefore, it was a Jewish locality, purely. The first Jewish writer who ever names it as a place of future punishment is Johnathan Ben Uzziel; who wrote, according to various authorities, from the second to the eighth century, A.D. The first Christian writer who calls Hell Gehenna, is Justin Martyr, who wrote about A.D. 150. Neither Christ nor his apostles ever named it to Gentiles, but only to Jews, which proves it a locality only known to Jews, whereas, if it were a place of punishment after death for sinners, it would have been preached to Gentiles as well as Jews. It was only referred to twelve times, on eight occasions, in all the ministry of Christ and the apostles, and in the Gospels and Epistles. Were they faithful to their mission, to say no more, on so vital a theme as an endless Hell, if they intended to teach it? Only Jesus and James ever named it. Neither Paul, John, Peter nor Jude ever employed it. Would they not have warned sinners concerning it, if there were a Gehenna of torment after death? Jesus never uttered it to unbelieving Jews, nor to anybody but his disciples, but twice (Matt. 23:15-33) during his entire ministry, nor but four times in all. If it were the final abode of unhappy millions, would not his warnings abound with exhortations to avoid it? Jesus never warned unbelievers against it but once in all his ministry, (Matt. 22:33) and he immediately explained it as about to come in this life. Gehenna is never said to be of endless duration, nor spoken of as destined to last forever, so that even admitting the popular ideas of its existence after death, it gives no support to the dogma of endless torment. Clement, one of the earliest Christian fathers, was a Universalist, and yet he uses Gehenna to describe the sinner’s punishment, showing that then the word did not denote endless punishment. A shameful death, or a severe punishment, in this life, was, at the time of Christ, denominated Gehenna, (Schleusner, Canon Farrar and others) and there is no evidence that Gehenna meant anything else, at the time of Christ. The purpose of Jesus was to show how exacting is Christianity. It judges the motives. This he affirms in the last sentence of the verse, after referring to the legal penalties of Judaism in the first two. The “Judgment” here is the lower ecclesiastical court of twenty-three judges: the “council” is the higher court, which could condemn to death. But Christianity is so exacting, that if one is contemptuous toward another, he will be adjudged by Christian principles guilty of the worst crimes, as “he who hateth his brother has already committed murder in his heart.” We give the true meaning of this passage in the words of “orthodox” commentators. “It is very probable that our Lord means no more here than this: ‘If a man charge another with apostasy from the Jewish religion, or rebellion against God, and cannot prove his charge, then he is exposed to that punishment (burning alive) which the other must have suffered, if the charge had been substantiated.’ There are three offenses here which exceed each other in their degrees of guilt. Anger against a man, accompanied with some injurious act. Contempt, expressed by the opprobrious epithet ‘raca’, or shallow brains. Hatred and mortal enmity, expressed by the term moreh, apostate, where such apostasy could not be proved. Now proportioned to these three offenses were three different degrees of punishment, each exceeding the other in severity, as the offenses exceeded each other in their different degrees of guilt. The judgment, the council of twenty-three, which could inflict the punishment of strangling. The Sanhedrim, or great council, which could inflict the punishment of stoning. The being burnt in the valley of the son of Hinnom. This appears to be the meaning of our Lord. Our Lord here alludes to the valley of the son of Hinnom. This place was near Jerusalem; and had been formerly used for those abominable sacrifices in which the idolatrous Jews had caused their children to pass through the fire to Moloch.” Com. in loc. We do not understand that a literal casting into Gehenna is here inculcated–as Clarke teaches–but that the severest of all punishments are due those who are contemptuous to others. Gehenna fire is here figuratively, and not literally used, but its torment is in this life. Whether Jesus here means the literal Gehenna, or makes these three degrees of punishment emblems of the severe spiritual penalties inculcated by Christianity, there is no reference to the future world in the language. These passages mean that it is better to accept Christianity, and forego some worldly privilege, than to possess all worldly advantages, and be overwhelmed in the destruction then about to come upon the Jews, when multitudes were literally cast into Gehenna. Or it may be figuratively used, as Jesus probably used it, thus: It is better to enter the Christian life destitute of some great worldly advantage, comparable to a right hand, than to live in sin, with all worldly privileges, and experience that moral death which is a Gehenna of the soul. In this sense it may be used of men now as then. But there is no reference to an after-death suffering, in any proper use of the terms. The true idea of the language is this: Embrace the Christian life, whatever sacrifice it calls for. The latter clause carries out the idea in speaking of the undying worm. The prophet and the Savior both referred to the overthrow of Jerusalem, though by accommodation we may apply the language generaly understanding by Hell or Gehenna, that condition brought upon the soul, in this world by sin. But the application by the prophet and the Savior was to the day then soon to come. The undying worm was in this world. The worms that bred in the filth of “Gehenna are made emblems of the corruption of the sinful soul in this world; so Isaiah taught, and Jesus quoted his language. Strabo calls the lamp in the Parthenon, and Plutarch calls the sacred fire of a temple “unquenchable,” though they were extinguished ages ago. Josephus says that the fire on the altar of the temple at Jerusalem was “always unquenchable,” abeston aie, though the fire had gone out and the temple was destroyed at the time of his writing. Eusebius says that certain martyrs of Alexandria “were burned in unquenchable fire,” though the fire was extinguished in the course of an hour! The very expression in English, which Homer has in Greek asbestos gelos, (Iliad, i:599) unquenchable laughter. The reader of these verses and the accompanying language, will observe that Jeus is exhorting his disciples to have entire faith in God. The most that men can do is to destroy the body, but God “is able,” “hath power” to destroy both body and soul in Gehenna. It is not said that God has any disposition or purpose of doing so. He is able to do it, as it is said (Matt. 3:9) he is “able of these stones to raise up children unto Abraham.” He never did, and never will raise up children to Abraham of the stones of the street, but he is able to, just as he is able to destroy soul and body in Gehenna, while men could only destroy the body there. Fear the mighty power of God, who could, if he chose, annihilate man, while the worst that men could do would be to destroy mere animal life. It is a forcible exhortation to trust in God, and has no reference to torment after death. fear not those who can only torture you–man–but fear God who can annihilate, (apokteino). This language was addressed by Christ to his disciples, and not to sinners. Looking upon the smoking valley, and thinking of its corruptions and abominations, to call a man a “child of Gehenna” was to say that his heart was corrupt and his character vile, but it no more indicated a place of woe after death, than a resident of New York would imply such a place by calling a bad man a child of Five Points. Isaiah has reference to the same (Isa. 66:24): “And they shall go forth, and look upon the carcasses of the men that have transgressed against me; for their worm shall not die, neither shall their fire be quenched; and they shall be an abhorring unto all flesh.” This explains the “unquenchable fire” and the “undying worm.” They are in this world. A tongue set on fire of Gehenna, when James wrote, was understood just as in London a tongue inspired by Billingsgate, or in New York by Five Points, or in Boston by Ann Street, or in Chicago by Fifth Avenue, would be understood namely, a profane and vulgar tongue. No reference whatever was made to any after-death place of torment, but the allusion was solely to a locality well known to the Jews as a place of corruption, and it was figuratively and properly applied to a vile tongue. If Paul believed in a place of endless torment, would he have been utterly silent in reference to it, in his entire ministry? His reticence is a demonstration that he had no faith in it, though the Jews and heathen all around him preached it and believed it implicitly. A careful reading of the Old Testament shows that the vale of Hinnom was a well known and repulsive valley near Jerusalem, and an equally careful reading of the New Testament teaches that Gehenna, or Hinnom’s vale was explained as always in this world. (Jer. 7:29-34: 19:4-15: Matt. 10:28) and was to befall the sinners of that generation (Matt. 24) in this life (Matt. 10:30) that their bodies and souls were exposed to its calamities. It was only used in the New Testament on five occasions, either too few, or else modern ministers use it altogether too much. John, who wrote for Gentiles, and Paul who was the great appostle to the Gentiles, never used it once, nor did Peter. If it had a local application and meaning we can understand this, but if it be the name of the receptacle of damned souls to all eternity, it would be impossible to explain such inconsistency. The primary meaning then, of Gehenna is a well-known locality near Jerusalem; but it was sometimes used to denote the consequences of sin, in this life. It is to be understood in these two senses only, in all the twelve passages in the New Testament. In the second century after Christ it came to denote a place of torment after death, but it is never employed in that sense in the Old Testament, the New Testament, the Apocrypha nor was it used by any contemporary of Christ with that meaning, nor was it ever thus employed by any Christian until Justin and Clement thus used it (A.D. 150) and the latter was a Universalist, nor by any Jew until in the targum of Jonathan Ben Uzziel, about a century later. And even then it only denoted future, but did not denote endless punishment, until a still later period. The English word Hell occurs in the Bible fifty-five times, thirty-two in the Old Testament and twenty-three in the New testament. The original terms translated Hell (Sheol-Hadees) occur in the Old Testament sixty times and in the New Testament twenty-four times; Hadees eleven times, Gehenna twelve times, and Tartarus once. In every instance the meaning is death, the grave, or the consequences of sin in this life. Thus the word Hell in the Bible, whether translated from Sheol, Hadees, Gehenna, or Tartarus, yields no countenance to the doctrine of future, much less endless punishment.